The White House announces plans to invite Russian leader Vladimir Putin to Washington. No details have come out from the one-on-one conversation between President Donald Trump and Russian President Vladimir Putin this week. Democrats are calling for the notes of Trump's interpreter to be subpoenaed, or to compel her to testify. Both Trump and Putin have said the summit was positive. Donald Trump and Vladimir Putin may have reached several historic agreements at their summit in Finland this week. Or, they may not have. It depends on who you talk to. Three days later no one was quite sure. With no details emerging from the leaders' one-on-one discussion on Monday — other than the vague outline they offered themselves — officials, lawmakers and citizens in the U.S. in particular are wondering what, if anything, was actually agreed to. 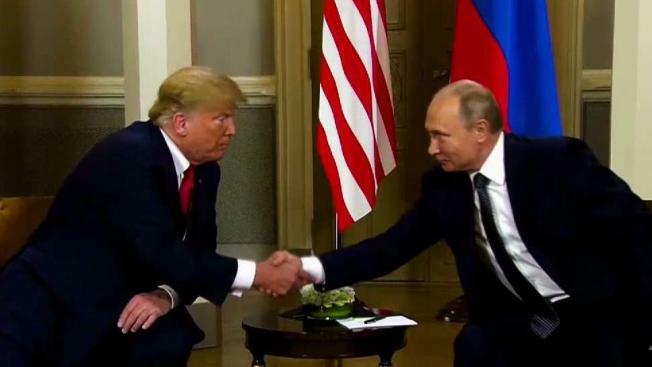 Both Trump and Putin have declared the meeting a grand success that is soon to reap great rewards in numerous geopolitical realms, yet even the most complete accounting of the talks — one provided by Putin — suggests that any outcomes are far from certain. And, the fact that a high-profile, high-stakes summit between the commanders in chief of the world's two biggest nuclear powers could be held without a solid achievement or failure to point to has flummoxed many. In the U.S., frustration with the lack of information has raised already heightened suspicions of Trump. Democratic lawmakers have pushed to subpoena the notes of the State Department interpreter who translated for Trump or compel her to testify. Republicans have blocked the move. Officials said Thursday the White House and State Department were also likely to fight such a move as a breach of executive authority, making the appearance of the notes unlikely until they are published in a historical record decades from now. In a short press conference before a private meeting with Russian leader Vladimir Putin, President Donald Trump called the two countries "the two great nuclear powers" and stated that the U.S. wants to have a better relationship with Russia. The meeting comes the week after 12 Russian intelligence officers were indicted on hacking charges related to the 2016 presidential campaign. So for now, everyone but Trump and Putin and perhaps a handful of their close confidants are in the dark. Even Trump's own intelligence chief, Dan Coats, said Thursday, "I don't know what happened in that meeting." "It is utterly amazing, utterly amazing, that no one knows what was said," Chuck Schumer, the top-ranking Democrat in the Senate, said. "This is a democracy. If your president makes agreements with one of our leading — if not our leading — adversary, his Cabinet has to know about it and so do the American people." Typically, a summit, especially one between two major powers, will occur after weeks and months of meticulous planning at lower levels with an eye toward producing demonstrable results. Agenda topics, talking points, desired outcomes and even major portions of significant agreements are normally negotiated in advance so the relevant agencies of both countries are aware of any potential policy changes. In some cases, the actual summit meeting and leaders' signatures on a piece of paper or a joint communique are mere formalities as the hard work has already been done by subordinates. Those conventions have been upended by Trump's buccaneering approach to affairs of state — the kind of approach he thinks worked in his landmark summit with North Korean leader Kim Jong Un last month. But this time there was no joint statement to formalize the outcome of the talks — just a meandering, 45-minute press conference where Trump stoked controversy by appearing to side with Putin over U.S. intelligence agencies' assessment that Russia meddled in the 2016 election. Russia's ambassador to the U.S., Anatoly Antonov, expressed hope Thursday that "the verbal agreements between Putin and Trump will be fulfilled" — though the substance of any such understandings remain murky, not least because the main business was conducted in the two hours of discussions between the two leaders with only translators joining them. On Thursday, the Trump administration poured cold water on at least one proposal from Putin: that Russia be allowed to interview Americans the Kremlin accused of crimes — the quid pro quo for allowing U.S. investigators to interrogate Russian intelligence officials recently indicted in the U.S. for alleged election interference. President Trump was asked if he held Russia accountable for a decline in relations with the U.S. He said there is blame on both sides. "That's not going to happen," Secretary of State Mike Pompeo said of the Russian proposal in an interview with the Christian Broadcasting Network. Still, from Putin's perspective, the summit put Moscow and Washington on "the path to positive change." In recent days he has spoken of finding broad consensus with Trump on ensuring security along Syria's border with Israel and on arms control issues. Russia's defense and foreign ministries, meanwhile, have both said they are ready to start putting those agreements into action. Trump himself has also put a positive spin on the summit. He says a second meeting with Putin will usher in the implementation of the laundry list of items they discussed in Helsinki. Those, he said in a tweet, include terrorism, security for Israel, nuclear proliferation, cyberattacks, trade, Ukraine, Middle East peace and North Korea. "There are many answers, some easy and some hard, to these problems ... but they can ALL be solved!" he said. Pressed for details, however, the White House could not provide any. Press secretary Sarah Huckabee Sanders mentioned Syria, Iran, Israel, arms control, Russia's annexation of Crimea from Ukraine and its meddling in 2016 U.S. election as having been discussed. But turning those issues from topics of discussion into action apparently remains a work in progress. "This is the beginning of the dialogue with Russia and our administration and theirs and we're going to continue working through those things," she told reporters at the White House on Wednesday. Just minutes later, the State Department offered its own take on the Helsinki meeting, saying that no agreements were reached; just general proposals on matters mainly related to economic and strategic cooperation. Spokeswoman Heather Nauert said three proposals were made: one for a high-level working group with U.S. and Russian business leaders to be convened; another for the creation of an "expert council" of academics, current and former diplomats and military officials from both countries to look broadly at U.S.-Russia relations, and a third one for the U.S. and Russian national security councils to hold a series of follow-on meetings. "You know, these are certainly all modest proposals," she said. "The president had said going into this that we wouldn't solve all the world's problems in one meeting, in one conversation with the Russian government but we think it's a pretty good place to start." At the Pentagon, officials were still waiting to see if their marching orders in Syria would change as a result of the summit. The commander of U.S. forces in the Middle East said Thursday he had not received new guidance from the Pentagon on cooperating with Russia in Syria. "We have received no further direction than we've currently been operating under," Gen. Joseph Votel said in a video-teleconference from his headquarters in Tampa, Florida. He said he's taking a "steady-as-she-goes" approach in Syria in the absence of new instructions. 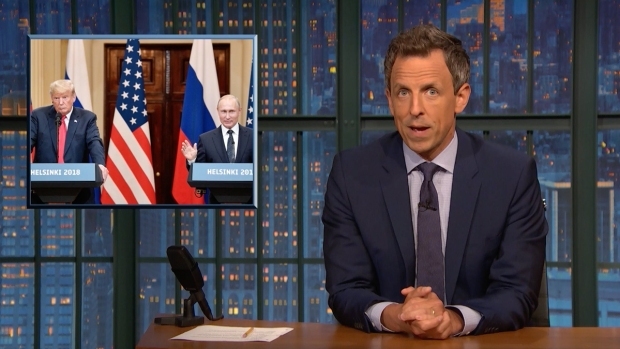 Seth Meyers takes a closer look at President Donald Trump meeting Russian President Vladimir Putin in Finland and delivering one of the most surreal performances by a president in modern American history.